Quinoa is a seed that dates back thousands of years. It was first discovered and consumed by the Incas of South America. In the Incan culture, it was considered "the gold of the Incas" because it gave the warriors of the tribe increased stamina. It was a super food 4000 years ago and it still has the same great benefits that the Incas recognized then. There are benefits to eating Quinoa because of its composition and the way it digests in the body…not to mention, it’s great tasting too! Quinoa is one of the most protein-rich foods found in the world. It contains all 9 essential amino acids that are required to grow muscles within the body. For this reason, it is a great addition to the diets of vegetarians, vegans and others who have difficulty reaching their protein goals. Magnesium is a nutrient used in the body to relax muscles and blood vessels. Quinoa is high in magnesium which can be a benefit for many since a diet high in magnesium helps to alleviate migraines. It may also help diabetics control their healthy blood sugar. This nutrient also helps regulate body temperature and form healthy bones and teeth. 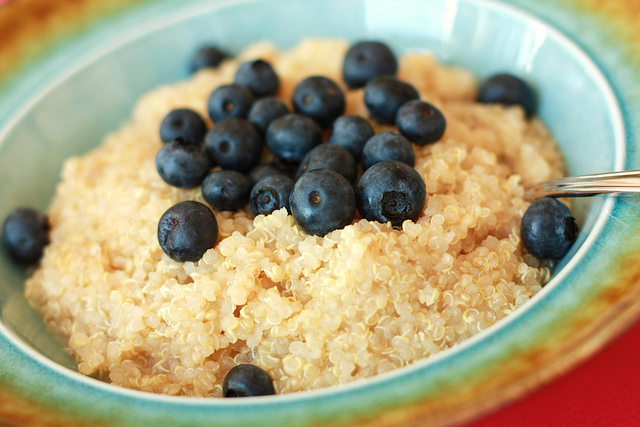 Quinoa is a great way to get fiber into a diet. It contains almost twice as much fiber as grains. Fiber can help with regular bowel movements, decrease constipation and tones the colon. It also prevents heart disease by reducing high blood pressure. Quinoa is an Ideal "Grain"
Quinoa is actually a seed related to the spinach family, however, it acts as a grain in the body. It also cooks and tastes like a grain and once digested, quinoa acts as a probiotic that feeds good bacteria in the intestines. It digests easily and nutrients are almost completely absorbed in the body. It is also gluten-free, which is a problem with most grains for celiac and people with autism. Quinoa is a food rich in B vitamins. It is also great for vegetarian cooking. Quinoa, bearing little of its own flavor, is great to cook with because it takes on the flavor of anything prepared with it. It is a super food packed full of nutrients. It was discovered ages ago but today, many people are discovering quinoa for the first time. It is great to incorporate into a diet to ensure you are eating nutrient rich foods. The Quinoa Corporation calls quinoa the "Supergrain of the Future." This is a guest post by Mark Lynch. Mark recommends finding more great information on culinary cooking at Chefs.edu.